A great collectors item from Fourteen Balls Toy Company. 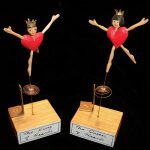 A pair of tiny hand carved crowned royals, which vibrate lovingly on their spring mechanisms. Both pieces are number 1 of the edition from January 2001. Height of each piece 10 cm Sold as a pair only. £250 (excl. VAT) Sold.